The listing calls it Thrash Pop, which I don’t really like, and I think it’s been called Dance Metal. I read Pop Rock somewhere which I thought was the kind of stuff the Goo Goo Dolls make. I made up Avant Hard because I thought it was funny but then had to draw attention to it because people are liable to take that stuff seriously. 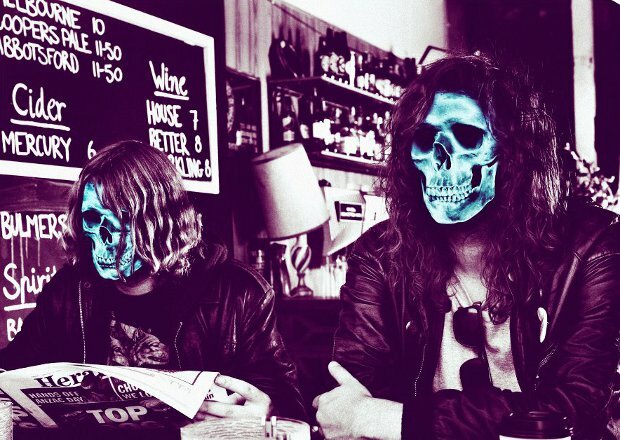 Ridiculous genre names are the result of an industry that places too high a value on genre definitions (Which I won’t go into here), but also down to DZ Deathrays’ sound; where slick hooks rub shoulders with grizzled guitar and bruising drums. It’s a neat trick, and the net result is a whole load of dour kids in black skinnies shaking it. The pints are in plastic cups; DZ are the kind of band to inspire a thrown glass or two, and tonight I am one dour kid, complete with plastic pint; black skinnies bulging with a notepad too tight to fit. Bad Grammar are supporting, and being Silent Radio Family I won’t wax too lyrical about them here but they play an upstart, underdog brand of two piece garage; with swagger and bravado but without ego. The lead singer pokes fun at himself and hops about the stage; the snare sounds like slapping a puddle, and they have the same riotous, bibbidy-bop, machine gun delivery as White Denim. They opened for Drenge at the Roadhouse earlier in the year, and are definitely keeping good company. DZ Deathrays hit the stage and hit the ground running; Black Rat is every inch the snarling opener on the album, and plastic pints litter the air in total safety. Long hair frames singer Shane’s face, hanging in a fine curtain and forming a blurred frizzy halo as the track picks up pace, before gravity plays its trick, and it returns, as the track plods again. Tracks from the first album sound like grazed knuckles; a night of hard drinking and its consequences, and by ‘Cops Capacity’ the entire mass of dank locks is firmly stuck to his forehead, making the band look and sound like drunken horror movie of that first album. The crowd howls its battlecry of “cops capacity, cops cops capacity” without a word of encouragement from onstage, and with DZ close to the crowd each they can all taste the sweat of the Brisbane houseparties where they cut their teeth. And they’ve been to enough parties; they know you’ve got to pace yourself. Whilst there is a slight divide between tracks from the two albums, it’s not all sledgehammer punk. On Black Rat they show the same knack for combining groove and iron shod riffs as Death From Above. Tracks like ‘Fixations’, and ‘Reflective Skull’ have a dark, slinking danceability to them, and ‘Night Slave’ exemplifies this. They barely pause for breath; ‘The Mess Up’ has the same booze-fuelled fatalism as its video, with breathy whoops of ‘Kill’ and relentless fuzz. The material from the new album is well received, ‘Northern Lights’ in particular has Springsteen simplicity, and reaches a suitably rousing climax, but it’s for the final, swaggering punk track ‘Gina Works at Hearts’ that the crowd screams themselves hoarse. It rumbles throatily, before going quiet to hear the crowd’s cracked voices and sounds gigantic as it subsequently punches you in the throat. I wake the next morning with my tongue feeling too big for my mouth and some strange notes. Chatting to the band after the gig it turns out their favourite Bond theme is Goldfinger, the last CD in the van: Brawlers. Last band on the Ipod: Digitalism. Somewhere scribbled in the back it says ‘any band that makes a goth twerk must have somethin’’. It bears all the hallmarks of what was probably a great party.